First of all, let me disclose that I do some product reviews and I did receive the headlights at a very generous discount for an honest review. Neither of these links are affiliate links or anything. The Gauge LEDs I bought on Ebay, a lot of 100 (20 of 5 different colors). The headlamp was direct plug and play. It took a little maneuvering to get the locking arm around it, but no cussing ensued. You can hear the fan kick on in the headlight if the engine isn't running. The turn signals ARE polarity sensitive. If you have them in backwards, they be locked in full bright mode and won't flash. Flashing on the LEDs are also not as dramatic as the stock bulbs, less of an intensity difference. I can live with that, I'd rather be well lit all the time. The gauge lights I got are also polarity sensitive. Anyways, thought I'd let y'all know some of the cheap farkle stuff I found. I've seen a lot of threads asking about LEDs and some weird information about upgrading the harness to handle them (which I think is meant for HIDs, not LEDs). Everything here is plug and play except having to change the 1 relay which takes 5 seconds when you're changing the indicators anyways. Blue dash lights are cool, especially if you ride in the dark. I initially put in the blue ones. 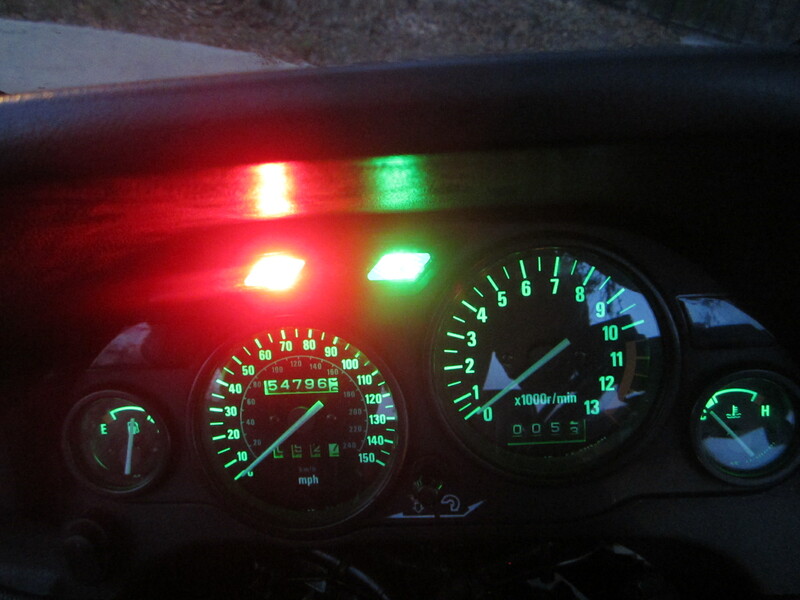 For whatever reason, the somewhat more modern appearance of a blue dash clashed with my concept of what the bike should look like, so I switched to green LEDs (WLED-G5 from superbrightleds.com). The green does look nice, even with the LEDs I got they're brighter than the blues. I agree with the look of the LEDs with the traditional look of the Connie. Green just doesn't match with BB's current attire. Purple would have been awesome, but purple LEDs are even more dim. I think I got a pretty good deal getting 100x 194LEDs for under $8 for how well they work though. I'm very sensitive to high-contrast situations, for example, a TV in a dark room with no lights is painful for me. I really don't notice the green being so bright even on a dark road. Now the neutral and high beam indicators? The first LEDs I had in there were distractingly bright so I went to a dimmer bulb. Could be dimmer still for my taste even after the change. Thanks. High praise coming from you. I've put 12,000 miles on the clock since that picture and it's still all smiles every time. Nice to see some miles piling up on Shoodaben. Oh I didn't know Swampcat bought Shoodaben. I should have guessed after seeing SISF's video that he was getting rid of the C10. Low miles on that bike! The cool white is the "in between" option of the blue and green. It keeps the original colors (redline is still red). Really all it does is crisp it up a bit. I see from the instrument cluster images that the LEDs don't seem to improve the ability to read the Speedo's Trip Odometer at night that much. I'm guessing that is a limitation of the bulb placement in the cluster. How much easier is it to see the clock at night? Is there a link available to the 194 gauge cluster bulbs? The 194 LEDs that I bought were an ebay listing lot of 100. I can sell you a kit to do your gauges, or if you can wait until Jan when I'm getting my 194 connectors in, you can check and see if I can fix the uneven lighting. I should have spare connectors for another cluster or 2. The clock doesn't take a 194 bulb, it takes something a bit smaller, but I'm going to be attempting to put a 194 LED in there when my 194 connectors come in Jan as well. The blue is the dimmest / least visible of the colors by a decent margin, and it seems to be true of any of the LED manufacturers. Even if I have the high beam on, the oil light and Neutral light are more intense than the high beam light. Whether this is a result of how blue LEDs have to be made, or something to do with the lighting filter inside of our clusters I'm not sure. I'll probably be printing up a new gauge plate to replace the stock one over the summer and will have more answers then. I don't understand the reference to 194 connectors. You're right, the visibility of the trip odo on the speedo isn't any better with the LEDs. I don't have any issues seeing the clock at night with my setup. The bulbs in the gauge cluster are 194 bulbs, I'm going to add additional bulbs to the gauge cluster to better illuminate the dim areas, and will be converting the clock to a 194 bulb instead of the tiny little thing it's using currently. I attached pics of the beam pattern on low and high beam. The lights in the shop are off, there's a little bit of light coming through the door to my apartment just so I wouldn't kill myself getting to the bike. You'll have to excuse the mess in the shop, everything just kind of accumulates near the doors when I have 4 or more project bikes going. I bought a new roll cart you can see in the pics though, hopefully that will prevent me from leaving sockets on the floor. I have fine visibility of everything with LEDs, but I used the clusters that scatter the light well in the instruments. Clock is better too. The clock is very color sensitive. The cool white shows very blue. I'd use warm white there if trying to match the cluster with cool white, or green if using green like swampcat. However, the colored ones are going to be dimmer. Can you be more specific about which LEDs you are using? Saying that you "use the clusters that scatter the light" does not provide much help when trying to buy the same LEDs. I wrote this when drinking. Sorry. I was referring to the multi-led clusters that I used for the instruments. They scatter similar to incandescents. For the clock, oil, high beam, neutral, I used single LEDS. During the Alaskan summer, seeing the dash lights and blinkers is problematic. I'm looking at the superbrightled website. They show a couple different lumen outputs. Which ones did you all use? I am inclined to use the green 5 lm / 90 degree bulbs for the dash back lights. The blue 5 lm / 120 degree for the high beam. And the 23 lm / 120 degree bulbs for the oil, neutral, and turn signals. I only use the high beam in the spring and fall. And cannot see the turn signals in full day light. I'll throw something out here I see no one else has mentioned. DO NOT install LED into the High Beam indicator. I LOVE the bright green Gauge lights, Turn signal indicators are OBVIOUS during the middle of the day, but at night, when I hit High Beams, I CAN BARELY SEE over the BRIGHT BLUE LIGHT shining in my eyes. The next time I'm in the fairings I'm putting the stock bulb back. Just have to get the correct LED for the High Beam Indicator. I got one that has only 2 LED emitters on the sides of a circuit board. Since neither of them point directly at the lens, all the light is reflected (by a really poor reflector) before traveling through the lens. End result is it is a bit brighter than stock, but not overwhelming. On my first Connie I just put a piece of electrical tape with a small hole in the center over the High Beam indicator to reduce the glare during night riding. I have an abundance of block model car paint that I thought about doing the same thing, but it would be permanant. Then it occurred to me I had just enough "Smoke" plastidip left in a can to do all the indicators, and they'll still be much brighter than stock. If it doesn't look good, or is too dark, I can peel it. If it's not dark enough, I can add another layer! Page created in 0.617 seconds with 25 queries.